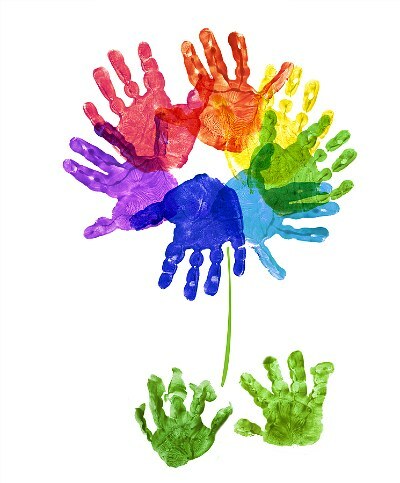 Rainbow handprint flowers make a beautiful keepsake for Mom, Grandma, a teacher, or another special person. The project can be made with one child or up to nine kids per flower. Start by stamping a red handprint near the top of the canvas. Rotate the canvas slightly. Have the next child stamp an orange handprint to the right. (If the same child is making the whole flower, wash his/her hands between colors.) Continue stamping and rotating until you have a circle of handprints in the six colors. Stamp a pair of green handprint leaves near the bottom of the canvas under the handprint flower. Before washing off the green, use a finger to draw a stem from the flower to the leaves. This image and a tutorial originally appeared on Kiboomu.